Property 14: New Private Forest Retreat: No Pet or Cleaning Fees! Property 17: Rebecca’s Nest-A Creekside Retreat! Property 25: Two bright rooms in charming 1910 Old Town cottage. Property 27: Scottsdale Kierland home w/Pool, 3 Bdrs, 2 Baths, modern and ready for you! Property 34: Steps to the BEACH and WATER PARK. Cleaning & Linens INCLUDED. Property 35: North Cape May! Pet-Friendly! 1 Block from the Bay! Historic Harthan - Downtown Austin New listing! Property 41: Historic Harthan - Downtown Austin New listing! 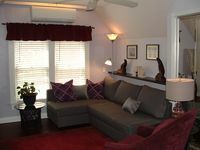 Property 44: Vermont getaway-your home away from home! ATTENTION : HERE IS YOUR PARADISE IN THE VALLEY OF SUN !!! Property 46: ATTENTION : HERE IS YOUR PARADISE IN THE VALLEY OF SUN !!! Property 48: NEW! Cozy, Quiet & Private Retreat just 5 min. from the National Park.